There is a beautiful balance of running water, ice forms along the river’s edge and drifts of snow at Elbow Falls right now. Following an early start, photographing the waterfall before dawn, I stayed for a long time playing with these elements. This is one of my favorite waterfalls and was happy to find a few new ways to photograph it on this visit. A couple of American dippers kept me company and I eventually turned my attention to them as splashed around hunting for breakfast in the fast-moving water. I look forward to sharing those images soon. This entry was posted on November 21, 2018 by Christopher Martin. 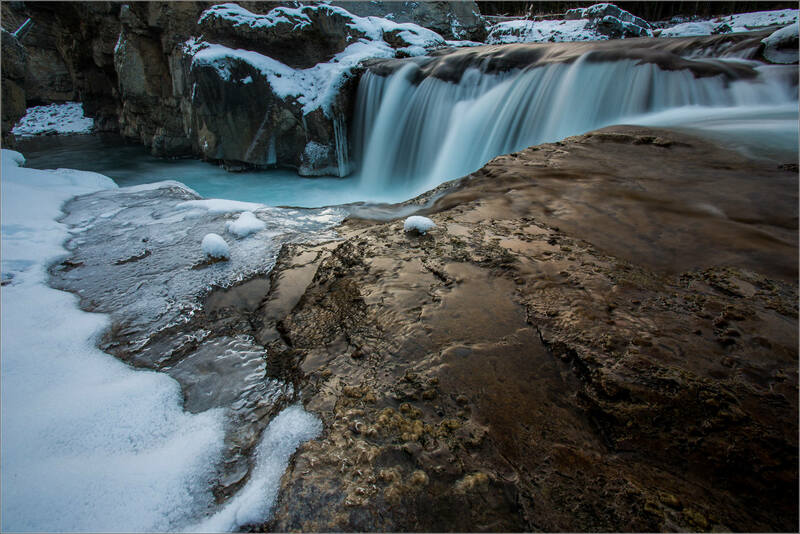 It was filed under Kananaskis, Landscapes, Water and was tagged with alberta, Canada, Elbow Falls, Elbow River, Kananaskis Country, landscape photography, running water, waterfall, winter. I’ve only seen that blue in glacier ice. It’s utterly beautiful. So many textures and love this point of view. Beautiful! I love these sorts of spots- reminds me of hiking in the mountains in the Northeast.